Planning a baby shower? Kim Vallee has a great feature on throwing a fabulous Pink French Baby Shower. Image via At Home with Kim Vallee. 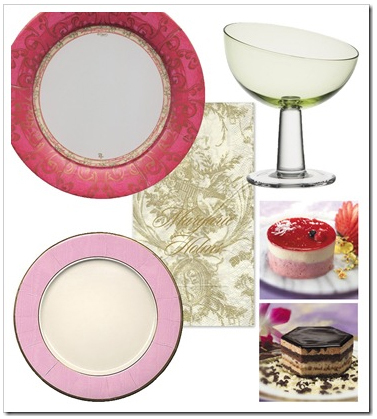 From top, fuchsia & gold plate, gold guest towel napkins, and pink dessert plate. She also found that these items, all from Caspari, are disposable party wares with a conscious. One of Caspari's key suppliers specializes in renewable resources and the fibers used in their paper-making come from managed forests. Additionally, Caspari uses water based dyes for napkins and plates and they use oxygen in preproduction instead of chlorine, eliminating the use of strong chemicals. Caspari is definitely a line that I should have included in our Eco-Friendly Products post for Blog Action Day. Thanks, Kim! At Home with Kim Vallee is all about hosting with style. Kim offers product reviews, decor inspiration, party themes, entertaining tips and recipes. Her inspiration boards are, by far, my favourite feature on her site. Be sure to stop by - this week is the launch of her new "eco-chic" style and living column which will appear every Wednesday!